Son of John, son of Accos; envoy of Judas Maccabeus to the Romans. To secure himself against the Syrians Judas sent Eupolemus with Jason, son of Eleazar, to win the Romans as friends and allies. The Romans granted his request, and the "senatus consultum," inscribed on brass tablets and given his envoys by Rome, was set up in Jerusalem (I Macc. viii. 17-28). As the mission of Eupolemus is referred to in general terms, without any specific statement of the underlying motives (II Macc. iv. 11), and as his genealogy seems historically correct—Accos ( ) is a noble family of Jerusalem (Ezra ii. 61; Neh. iii. 21)—historians like Mommsen, Mendelssohn, Grätz, Niese, and Schürer regard his mission as authentic. 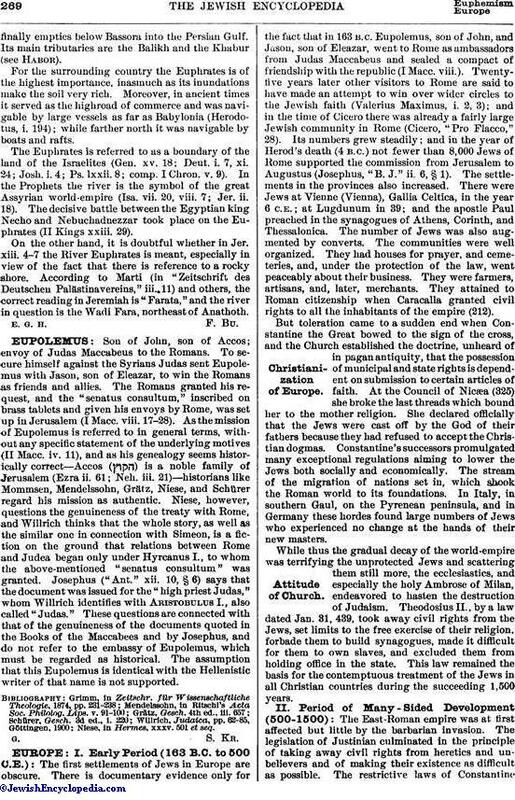 Niese, however, questions the genuineness of the treaty with Rome, and Willrich thinks that the whole story, as well as the similar one in connection with Simeon, is a fiction on the ground that relations between Rome and Judea began only under Hyrcanus I., to whom the above-mentioned "senatus consultum" was granted. Josephus ("Ant." xii. 10, § 6) says that the document was issued for the "high priest Judas," whom Willrich identifies with Aristobulus I., also called "Judas." These questions are connected with that of the genuineness of the documents quoted in the Books of the Maccabees and by Josephus, and do not refer to the embassy of Eupolemus, which must be regarded as historical. The assumption that this Eupolemus is identical with the Hellenistic writer of that name is not supported. Niese, in Hermes, xxxv. 501 et seq.